If making projects and being crafty are right up your alley, chances are you’ve already heard of Creativebug. If you haven’t, get ready to familiarize yourself with the net’s best DIY resource! With over 600 award-winning art and craft video classes, Creativebug offers endless paths to get started with your next project. Best of all, Ruffled is thrilled to announce we’ll be partnering with Creativebug and sharing a series of DIY projects for weddings over the next few months! With Creativebug, you can choose from categories like art, sewing, knitting, weddings, and more, and they’re adding new classes every week. Whether you’re a beginner or a pro, and no matter what your style is, you’ll be able to find the perfect video tutorial to spark your imagination and let your creativity flow. And for all you movers and shakers out there, you can download Creativebug’s mobile app so you can watch classes anytime and anywhere you’d like. Gather a group of friends, an iPad, and a bottle of wine or two and you’ve got an instant craft party! By starting your FREE trial, you can learn how to projects like these DIY napkins or a floral chandelier to hang above the dance floor. 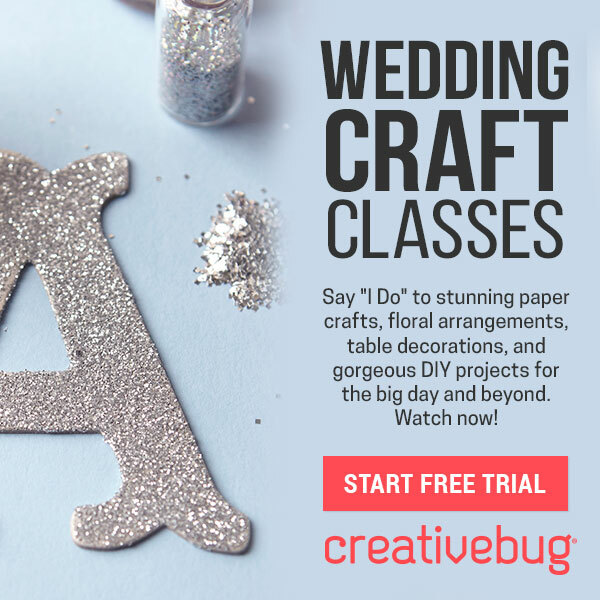 For our DIY brides, Creativebug has over 20 hours’ worth of videos in their Wedded Bliss series, where you can learn how to make centerpieces, bouquets, cakes, favors, signage, and so much more. If there’s a task you feel like taking on, Creativebug is there to make it happen and guide you along every step of the way. You can watch an overview of the course, take a look at what materials will be needed for the project, and also preview a gallery of images to make sure you’ll be prepared and happy with the course before you start taking it. If you’re still unsure, you can take advantage of Creativebug‘s free trial offer, which lets you keep one free class even if you choose not to renew. Basically, you have absolutely nothing to lose!